Case #1 18yo female with SS disease with Extremity Pain consistent with prior pain crises. No fever. CBC with a WBC of 22 and a HGB is 7. Retic Count is 12%. There are no tests to rule out vaso-occlusive crisis. Pain management guideline advises parental dilaudid or other opioid analgesic should be given within 30 minutes of triage. Reassess pain and re-administer opioids every 15-30 minutes until pain is under control. Consider dose escalations by 25% until pain is controlled. Initiate a PCA in the ED if possible. Administer NSAID’s in addition to opioids. There was a debate during the conference on whether ketorolac or ibuprofen was better for treating vaso-occlusive pain. Peds faculty preferred toradol. EM faculty prefered ibuprofen. IV hydration in the ED should be one bolus followed by maintenance fluids. No evidence favoring either Saline or LR. Fluid administration should be somewhat cautious to avoid acute chest syndrome and atelectasis. No indication for PRBC transfusion in the setting of pain crisis. No indication for O2 supplementation in non-hypoxic patients in the setting of pain crisis. In-patients should be encouraged to do incentive spirometry ever 2-3 hours. In-patients should also be encouraged to ambulate. Also topical heat therapy can be helpful for pain management. Case #2 4yo SS disease patient with fever and URI symptoms and cough. CBC with WBC of 17, HGB=7. Retic count was 8%. CXR shows perihilar haziness. Any fever in a child with sickle cell disease is treated as a medical emergency. Fever and pain should not be diagnosed as vaso-occlusive crisis. Get CBC, blood and urine cultures. Promptly administer broad spectrum antibiotics. IV Ceftriaxone is a common choice. Get a CXR for any cough, tachypnea, or abnormal lung sounds. Consult a Hematologist for all febrile sickle cell patients. Sickle cell patients with fever can be discharged if well appearing, >3yo, fully immunized, family has the ability to promptly return to ED. Hematologist at conference said she focuses on vital signs and age to make admission decisions. Kids who get admitted will get daily ceftriaxone. Further work up as indicated. A big new issue is that Medicaid patients need to have a referral from their PCP every time they see the hematologist. Case #3 12 yo male with SS disease, presents with fever and cough. CBC showed WBC of 13 and HGB =6.5. CX shows right side infiltrate. Risk factors for Acute Chest Syndrome are asthma and prior acute chest syndrome episodes. Acute Chest Syndrome is diagnosed by identifying a new CXR infiltrate with any one of the following: fever, tachypnea, dyspnea, hypoxia or chest pain. Early Acute Chest Syndrome may be subtle. There are no specific labs diagnostic of Acute Chest Syndrome. Admit all patients with Acute Chest Syndrome. Floor admit for stable kids is OK. IV Ceftriaxone, oral macrolide, pain management and supplemental O2 to keep sats over 95% are indicated treatments. Treat any bronchospasm. Simple or exchange transfusion should be considered. IV maintenance fluids are indicated. Any severe cases definitely should get exchange transfusion. Steroids are not indicated for Acute Chest Syndrome based on limited data. Elise comment: Do you ever diagnose pneumonia in sickle cell patients or is it always acute chest syndrome? Hematologist response: It’s always acute chest syndrome. Elise comment: It’s important to have a high concern for these patients. Acute Chest Syndroe can have disastrous outcomes compared to simple pneumonia. Markers of severe illness: multi-lobar disease, increased work of breathing, pleural effusions and low pulse ox despite O2 supplementation. Case #4 8yo with SS disease presents with right side weakness and slurred speech. CBC with WBC or 10.9, HGB =7. CT head is unremarkable. MRI/A showed scattered multifocal areas of abnormal signal. Patient was diagnosed with stroke. Peak incidence of stroke is 4-8 years of age. Transcranial Doppler can identify kids at higher risk of stroke. Work up in ED is to obtain an urgent CT followed by MRI/MRA. Exchange transfusion is indicated for sickle cell patients with stroke. Hematologist stated that MRI and exchange transfusion can be done in the PICU. A second stroke is likely without regular exchange transfusions. Even with exchange transfusion 20% of patients will have a second stroke. If you give a simple transfusion in the ED in general give 10ml/KG. This will raise the HGB by 3. Keys to success: Know your Back Up and how to utilize it. You don’t have to make all the decisions on your own. Louie illustrated this advice with how he managed a STEMI with the help of a cardiology consultant. They collaborated well on the case. Keys to success: Know your resources in the ED. Trust your training. The sick patients are the easy ones. 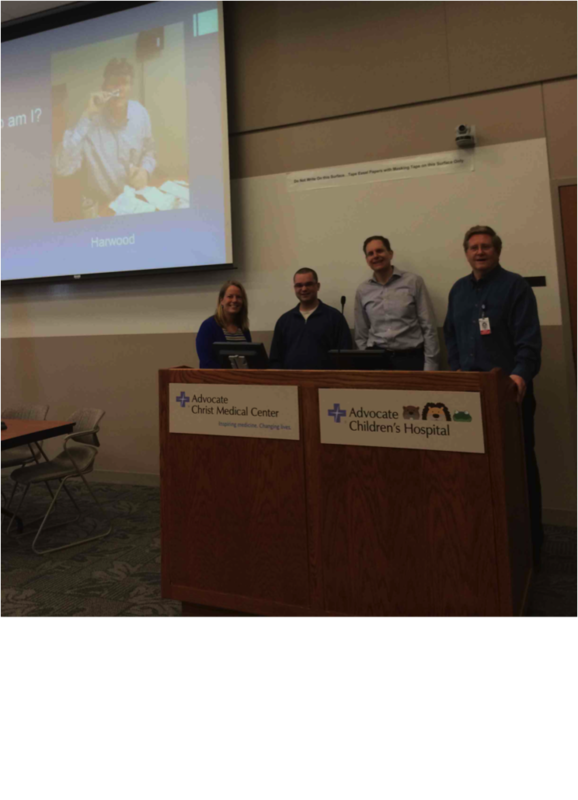 Louie described a case of tension pneumothorax in a trauma patient that needed a rapid chest tube placement. His success with this patient won him a lot of street cred with the nurses and other attendings. Keys to success: Stay calm in critical situations when everyone is looking to you to save a life. Be an expert multi-tasker. Louie described a case of a patient exsanguinating who he saved with a few key sutures. At the same time he had 15 other patients in the ED. He was able to focus on the sick patient and stay calm despite having many other patients in the ED. Keys to successs: Respect and get along with nurses and other staff. Be confident when directing your staff. Get an idea of who you can trust and who you need to watch a little more closely. Mid-levels: Basically mid-levels are professional residents. Most are very good. But there is a reason you went through residency. You will find that uncommon stuff that gets missed by mid-levels. It takes time getting used to signing mid-level providers’ charts on patients you haven’t seen. Keys to success: Get as much pediatric experience in residency as possible. Community ED’s have many limitations managing kids. So you need to be prepared. Scribes are the best asset ever for an emergency physician. They are life changing. You become far more efficient when working with a scribe. When choosing jobs, pick the job that has a scribe if all other things are equal. You definitely don’t want to work in an ED where you have to disposition your psychiatric patients on your own. It is critical to have a crisis worker to disposition psychiatric patients because they take so much time to find an appropriate treatment setting. You have to read your own plain films. Keys to success: Get as much experience as you can reading your own films during residency. Elise comment: The patient’s vital signs with all these above common diagnoses have to be trending toward improvement. If not then you have to consider more serious diagnoses. Case 1. 50 yo male with jaw pain due to AMI. 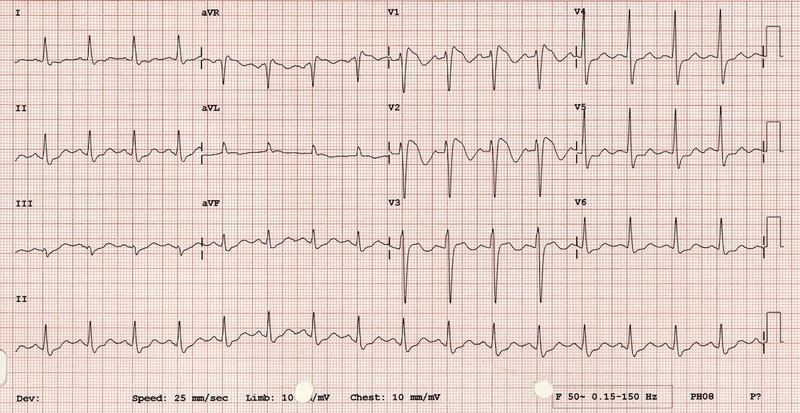 Patient has V-Fib cardiac arrest. Critical actions: ACLS care, defibrillate, get post-ROSC EKG, diagnose and treat inferior STEMI, get patient to the cath lab. Optimal care: Start heparin, ASA, Plavix and hold NTG due to suspected R side AMI. No need to cool patient because patient was conscious after defibrillation. Elise comments: If a patient becomes unconscious, ask first whether the patient has a pulse and what rhythm is on the monitor. Addressing V-Fib always comes before intubation. 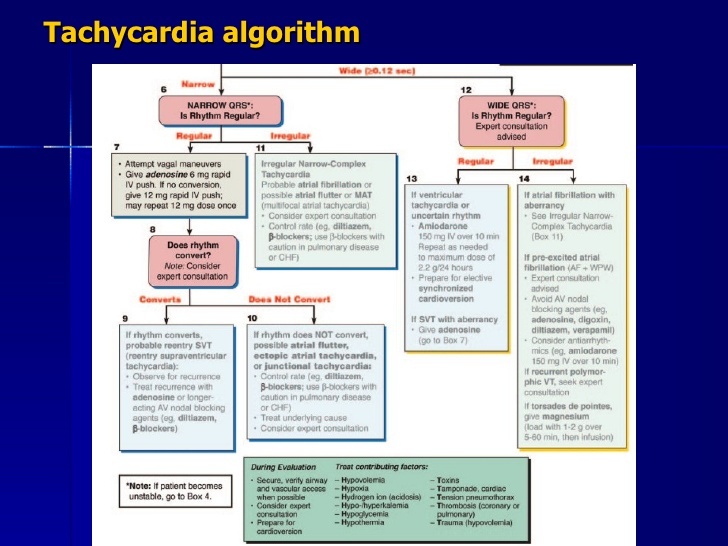 ACLS algorithms are driven by the rhythm identified on the monitor. Case 2. 42 yo female presents with neck and jaw pain. Patient has brawny induration of her anterior neck. Diagnosis was Ludwig’s Angina. Critical Actions : Give steroids and antibiotics, consult ENT, prepare for airway management, admit to the ICU. Ludwig’s is a clinical diagnosis. Airway compromise is the leading complication and leading cause of mortality. Not all patients however need intubation. Have anesthesia and ENT on consult early. It is not uncommon that patients can spontaneously improve with early steroids and antibiotics. Unasyn or Clindamycin are good choices to cover oral flora, which is the usual cause. 10mg of decadron is a good starting dose for management of this illness. Case 3. 27 yo male with dental/facial pain after being punched in the mouth. Felt like he spit out chips of his teeth. Patient has upper lip laceration through vermillion border. Patient has a fractured tooth Patient has exposed dentin but no exposed pulp. So this is an Ellis Class 2 dental fracture. Treatment of this patient required inferior infraorbital nerve block and consideration of an anterior superior alveolar nerve block. Repair laceration with approximation of vermillion border first. Apply calcium hydroxide (dical) over the Ellis fracture. What is fitness? There is not a single definition of fitness. Increased work capacity across broad time and modal domains is the crossfit definition. Elite endurance athletes are in upper 80’s and 90’s. Muscular strength is the ability to exert force during an activity. Strength is increased by resistance training. Other components of fitness are coordination, agility, balance and accuracy. Results are proportional to effort. Progressive overload is the key. High Intensity Interval Training is a way to gain cardiovascular benefit in short periods of time. You get increased skeletal muscle oxidative capacity, improved exercise performance and increased VO2. HIIT is considered safe for persons even if they have chronic disease. Bret then led us in a 6 minute high intensity work out. It was quite fun and may be a feature of conference going forward.